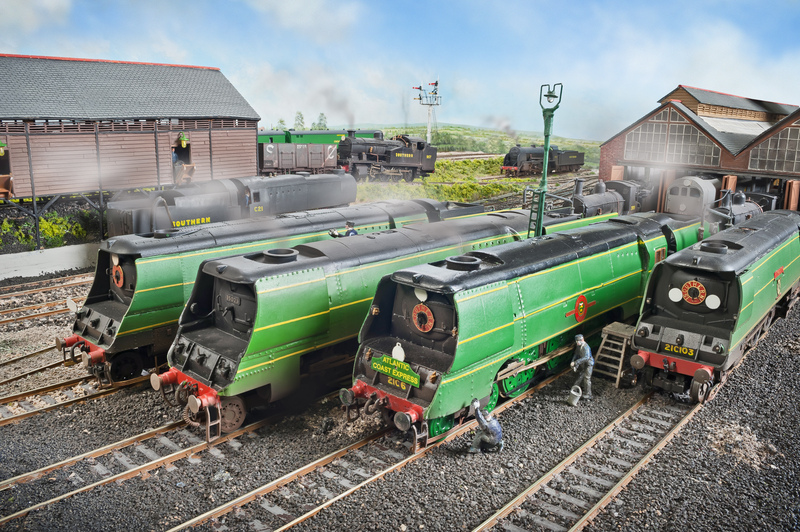 As advised the other week Fisherton Sarum will be exhibited at the Princes Risborough and District Model Railway Club’s Risex show this coming Saturday . This nice little local show that showcases a number of local layouts, is being held at the Community Centre, Wades Field, Stratton Road, Princes Risborough, Bucks, HP27 9AX. The show is open between 10 am and 5 pm and is well worth a visit, so come along if you can and say hello. Making their debut on Fisherton Sarum at the show will be two ex LSWR locomotives. Firstly is a repainted Hornby Drummond M7 to represent Salisbury allocated, long frame pull push fitted number 60. 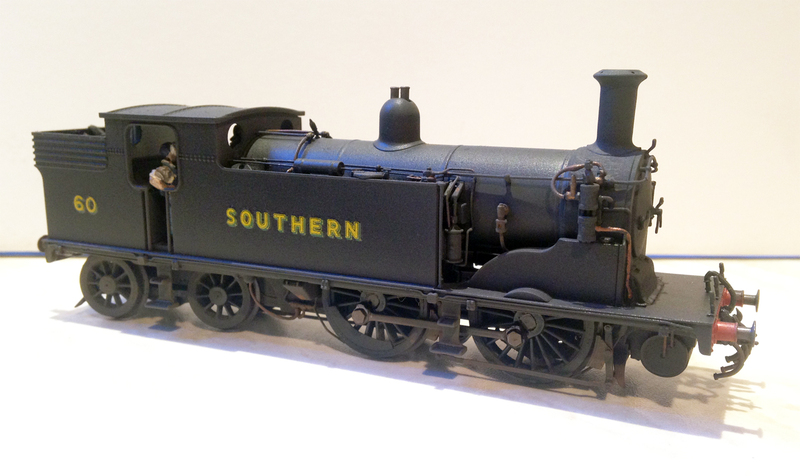 I have repainted this model from her original Southern olive green livery into post 1946 Southern Railway black with Bulleid Sunshine lettering to match my modelling period. The intention is that she will be paired with my ex LSWR Emigrant Stock Pull Push set 734. At past shows this set has run with a my heavily modified ex Triang M7 (that had been rewheeled, detailed with a Crownline kit and repainted) but as she runs on her original X04 open frame motor she tends to catch out operators with the amount of power required to get her to start. Number 60 has been repainted and lightly weather using my tried and tested method of Halfords plastic primer and satin black top coat and enamels picking out details before weathering. Further information on this process can be read here. The second locomotive to make her debut will be ex LSWR Adams A12 class 0-4-2 number 652, to work on either a secondary passenger or freight turns. I already have an Adams A12 in my locomotive fleet number 528 built quite some time ago as detailed in this post here, however she does not often appear on Fisherton Sarum as ideally she needs to be repainted and renumbered (as 654) in to Southern post 1946 black to be correct for my modelling period, but have not yet had the heart to do so. Number 652 was a salisbury allocated engine and will be seen on secondary passenger and freight turns. I can not lay claim to the build, as she was built by friend and excellent modeller Dave Taylor (some of you my have seen his fantastic 0-16.5 narrow gauge layout Bridport Town). 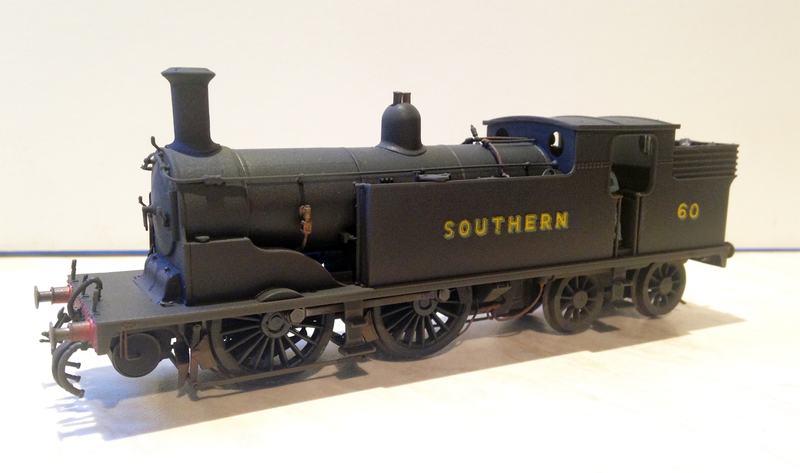 She like 528 has been expertly built by David from a Nu-Cast kit and his build can be read about here on Dave’s inspirational Southern Locomotives RMweb kit build thread. She needed a new home once he finished her, although a few final details have been completed by myself, and I could not resist the opportunity to own such a quality model, it will be an honour to have her running on Saturday at the Risex show. Fisherton Sarum’s next exhibition appearance after Risex will be on the 28th / 29th March at the London Festival of Model Railways organised by Warners and The Model Railway Club at Alexandra Palace, London. Alan’s Loughborough Road layout is a fictitious location but is based on the premise of the main road running south from Nottingham through West Bridgford to Loughborough. The Midland Railway line linking Kettering/Melton Mowbray/Nottingham runs through West Bridgeford and slightly further East was the London North Western and Great Northern Joint Railway line built to link Market Harborough & Peterborough/Melton Mowbray/Nottingham. There is no evidence that any station was proposed for West Bridgeford but it is not entirely impossible that the good citizens of West Bridgford – in 1900 a thriving and growing suburb – might have ambitiously established a terminus for the Midland Railway with LNWR running powers and all linked into a growing Nottingham suburban railway network. I always enjoy assisting Alan and Simon operating Loughborough Road with its pre-grouping splendour and can usually be found sat out the front happily shunting the yard and trying to keep up with the running sequence. 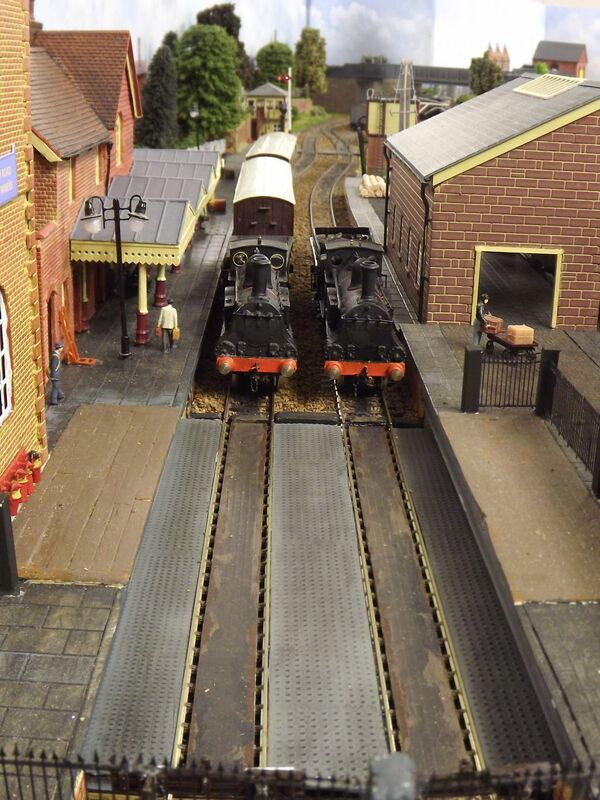 Keeping with the local exhibition Fisherton Sarum will be making is closest exhibition appearance to home next Saturday 21st February at the Princes Risborough and District Model Railway Club’s Risex show. It is being held at the Community Centre, Wades Field, Stratton Road, Princes Risborough, Bucks, HP27 9AX (I could probably hit the Community Centre with a lump of steam coal thrown from my house higher up on the Chiltern Hills escarpment, that’s how local it is!). The show is open between 10 am and 5 pm and whilst a smallish show it showcases a number of local layouts and is well worth a visit, so come along if you can and say hello.